Nicola Rose certainly knows how to paint water and weather and their effect on the landscape as this painting Facing the Storm shows. 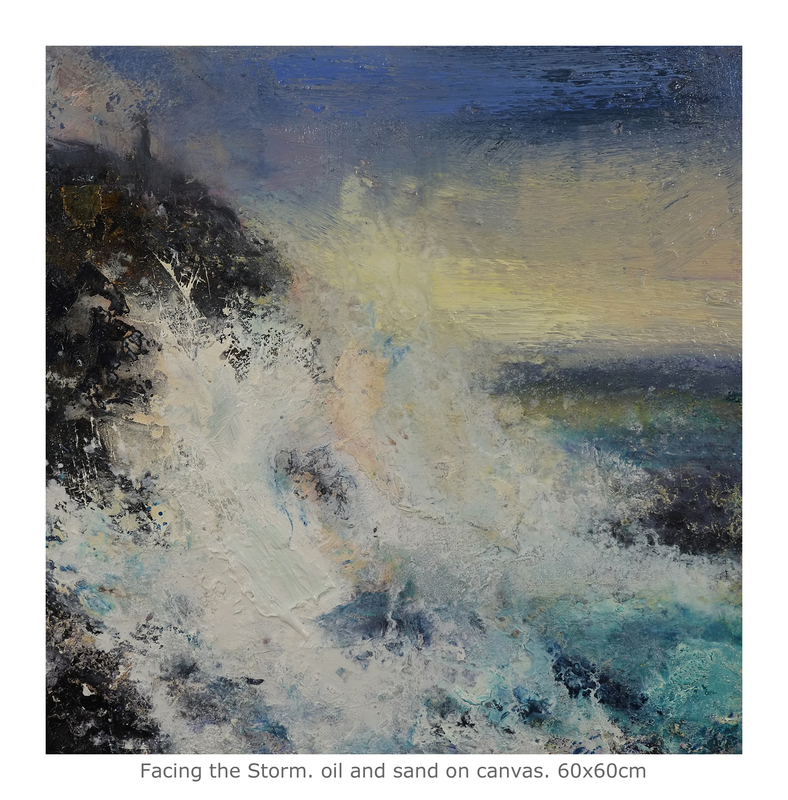 Her pictures are ‘a personal response to the extreme forces of nature’, a theme that will have a particular resonance to many affected by the recent weather in the UK. She is also very capable in depicting scenes of less tempestuous times too. To create her works she uses brushes, palette knives and her hands to build up layers of paint, sometimes blended with iron-fillings and sand, which finally evolve into the finished works. In this exhibition, supported by the Polish Cultural Institute, London, the young artist Gracjana Rejmer-Canovas has used the space to install a site specific work, of which individual sections are for sale. 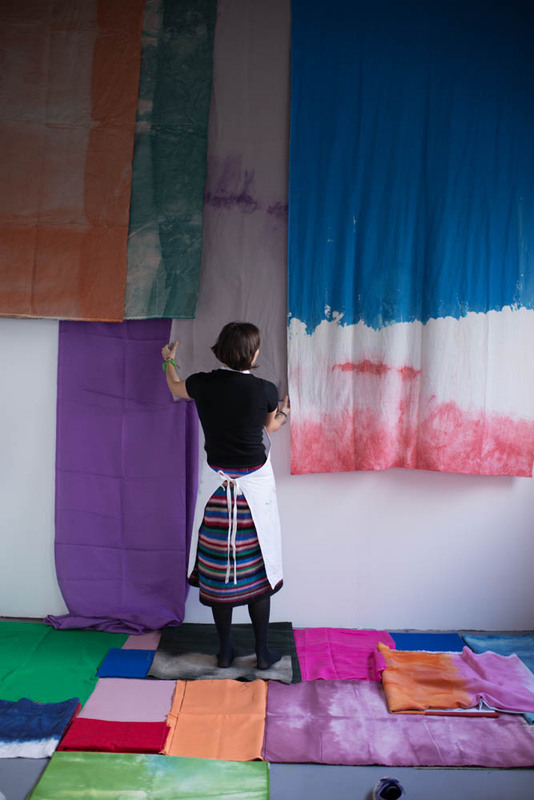 Using linen and cotton for her canvases, she first dyes them and then layers them with acrylic and oil paints creating individual shapes of varying sizes and forms for both walls and floor. They can be combined together to make a whole, while not losing their individuality as component parts. One can see her interest in the Colour Field painters and the American Abstract Expressionists reflected through these bright, colourful works. This is the first exhibition in Canary Wharf’s 2014 Sculpture at Work programme and has been arranged in conjunction with Kate Malone’s dealer, Adrian Sassoon, London. Her ceramics are always memorable whether the larger pieces that may be up to a metre in height or smaller studio works. She has a great ability to transform natural objects into intricate, beautiful works of art. While one can see a reflection of the long history of British pottery in her work she is also completely in tune with this age as her Atomics series proves. This entry was posted in British Paintings, Ceramics, Contemporary Art, Decorative Arts, Fine Art, Textiles, Visual Arts and tagged 20th Century Design, contemporary art, Decorative Arts, Fine art, textiles, Visual Arts.